Here’s a power-house of a collaboration! 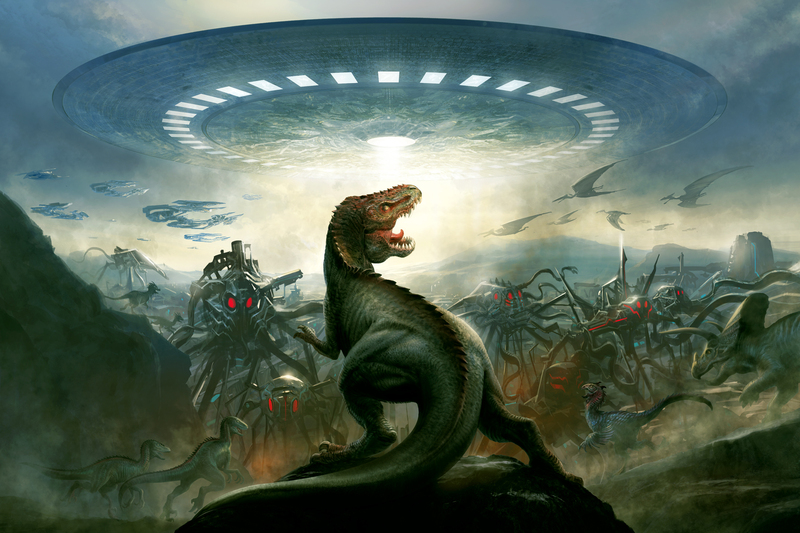 Barry Sonnenfeld, director of all three Men in Black movies (the third is coming up) has announced a new project: A graphic novel and movie to be called Dominion: Dinosaurs versus Aliens. Both the graphic novel and the movie script will be written by comic book writing superstar Grant Morrison, known for utterly re-inventing numerous comic book lines, including DC’s Animal Man. This is from Previews magalog: “When an alien invasion attacks Earth in the age of the dinosaurs, the planet’s only hope is the giants that roam the planet with, it turns out, a lot more intelligence than previously realized.” The graphic novel will be illustrated by Mukesh Singh (who previously teamed with Grant Morrison on 18 Days) and published by Liquid Comics later this year. A special preview of the graphic novel will be available for free (of course) on Free Comic Book Day, May 5th. No word yet on a release date for the movie, but Deadline.com has an extensive story on the project and an interview with Barry Sonnenfeld. I'm torn between two responses: "this is so cool" and "this is so stupid". Tending towards the latter, though.